MAUS Business Systems has become a renowned name throughout not only Australia, but across the rest of the Globe, with thousands of happy customers throughout the UK, New Zealand, Asia and the United States. We are living up to our reputation and lead the market as a worldwide, cloud based publisher of software. 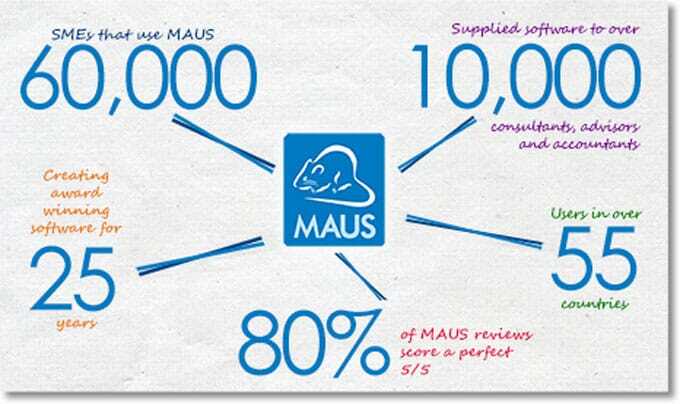 MAUS has now supplied software to more than 60,000 SME’s and over 10,000 Advisors and Consultants, across 55 countries, with all software developed in house by MAUS Business Systems, an Australian owned and based company. MAUS over the last 10 years has formulated and grown the MAUS Accredited Partner Program, which is now an Internationally renowned Network of over 80 independent business coaches, consultants, advisors and accountants. The MAUS Accredited Partner Program now boasts Accredited Partners in over 5 countries. If you require the expertise and assistance of an experienced professional business advisor or consultant than look no towards a MAUS Accredited Partner. Our MAUS Accredited Partners have a wealth of experience in a range of fields and will help to increase accountability and take your business to the next level. To get in contact with our Accredited Partners please select the “Find a Consultant” from the “About MAUS” drop-down menu. MAUS partners with International Networks! MAUS has established strong relationships with networks across various countries, ensuring our finger is constantly on the pulse across the globe. The Exit Planning Institute (EPI) is the premier provider of education, networking, professional development, and tools for exit planning professionals worldwide. The EPI’s Certified Exit Planning Advisor (CEPA) Program, created in 2007, is the only program of it’s kind and was developed by nationally recognised experts in the field of exit planning. Peter Hickey, the CEO of MAUS Business Systems, is the President for the Australian arm of the EPI and is at the forefront of Exit & Succession planning methodologies. MASMED was set up for the purpose of planning and implementing entrepreneurship development programs such as training, education, research and consultancy. MASMED’s goal is to enrich the body of knowledge in the field of entrepreneurship and nurture the development of quality entrepreneurs within Malaysia. They also strive to collaborate with the small and medium industry, and government agencies in promoting entrepreneurship.